Adhesive capsulitis has been know as shoulder periarthritis and adherent subacromial bursitis, but the current common term used to describe adhesive capsulitis, is frozen shoulder. These terms describe both active and passive limited range of motion (ROM) of an affected shoulder, in all planes of motion. The ROM limitation can be from minimal to severe and pain experienced can also range from intermittent mild discomfort to a chronic, severe condition. It is important to note (as in any musculoskeletal condition) that there may be an underlying pathology or condition that may either mimic or exacerbate the symptoms. It is imperative for a health care professional to know the full history of the client before proceeding with a diagnosis of adhesive capsulitis. If there is a history of rotator cuff tears and/or surgery, the body (brain) may be guarding against further injury. If the emotions surrounding such an injury have NOT dealt with, the body will continue to protect against possible further injury. Anybody who has endured a prolonged case of frozen shoulder has experienced this mind/body dynamic, and can attest to the emotional ranges associated with loss of movement and pain. Frozen shoulder can occur from overuse, chronic shortening, and injury. Common contributing factors of idiopathic frozen shoulder are chronic chest breathing, side sleeping with one or both hands under the head, overuse from repetitive motion, and poor office ergonomics coupled with extended sitting. The deep muscles involved in mobilization of the shoulder are termed as the rotator cuff. The common action of the rotator cuff muscles is stabilization of the humerus (long arm bone) at the glenohumeral joint. The glenohumeral joint is where the head of the humerus meets the scapula (shoulder blade). In other words, the rotator cuff is responsible for the movement of the arm in all planes of ROM and just as importantly, keeps the arm attached to the body. There are four muscles attaching directly from the scapula to the upper portion of the humerus, and the acronym for this group is S.I.T.S, which stands for Supraspinatus, Infraspinatus, Teres minor, and Subscapularis. 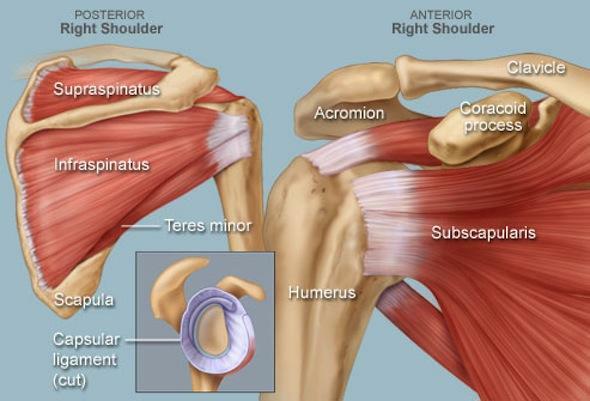 The Supraspinatus muscle is the most common of the four to be injured in a rotator cuff condition. When a rotator cuff injury is suspected, obtaining an MRI (Magnetic Resonance Imaging) of the affected area is the best course of action to determine the injury sustained and the extent of damage. In order to access the S.I.T.S. muscles manually, the superficial fascia (membrane covering muscle tissue) and musculature overlying the rotator cuff needs to be significantly warmed, loosened, and treated. The superficial muscles of the upper back, shoulders and arms are the Trapezius, Rhomboids, Latisumus Dorsi, Deltoid, Bicep, and Tricep. Forced stretching, trigger point therapy, or ANY manual therapy which increases the pain response, will only result in exacerbation of the condition. Furthermore, nerve entrapment by the neck, upper shoulder/back, and chest muscles limits the amount of energy available for the rotator cuff to operate correctly. When this occurs, the superficial musculature must pick up the slack and do the job of the rotator cuff, setting up a chronic pain/spasm/pain cycle. The continued weakening of the rotator cuff generally leads to a rotator cuff tear, which may or may not require surgical intervention. If the rotator cuff muscles are injured either from direct trauma, overuse trauma, or chronic shortening, the larger muscles will take over the action of the smaller rotator cuff muscles, become overworked, and the signal to the brain will be of malfunction (injury) and the muscles will begin to guard against further injury, limiting overall ROM of the shoulder, helping to prevent further injury. If the larger, superficial muscles are dysfunctioning, the smaller, deeper rotator cuff muscles pick up the slack, wear out quicker, and are only left to perform their common action. At this point, the brain is being signaled of the malfunction of the shoulder region, coupled with the client’s stress of the unknown, the shoulder goes into a protective mode. With increased pain and limited ROM, the brain senses injury and the muscles guard against further injury. In either case, frozen shoulder always involves nerve entrapment which can lead to further conditions such as thoracic outlet syndrome, tennis/golfers elbow, bursitis, carpal tunnel syndrome, and trigger finger. These conditions may also appear while experiencing frozen shoulder. Ice massage of the shoulder, neck, upper chest/arm, and upper back/arm. Inflammation of these areas causes nerve entrapment. The use of heat acts as an analgesic. However, heat will only worsen an inflammation issue. Simply take a white balloon (colored balloons will transfer color to the skin if used with some lotions) and fill it (do not expand the balloon) to the size of a large lemon, release any air from the balloon to prevent air pockets, tie off and freeze. Once frozen, they can be used to massage over any sore or inflamed tissue. As a general rule, cease icing when the area becomes numb. Epsom salt. Magnesium sulfate can be found at the grocery store. Follow the directions on the container for an Epsom salt soak. Ensure the temperature of the water is NOT hot. Hot water will exacerbate inflammation. Luke warm water is sufficient. This can also be combined with ice massage for contrast hydrotherapy. As a general rule in contrast therapy, ice should be applied 1/3 the time of heat. In this example 9 minutes Epsom soak to 3 minutes ice massage. For contrast therapy, repeat the process at least 3-4 times. Stretch the affected arm , as well as the chest and neck. Nerve supply for the rotator cuff muscles originates from the neck area. The nerves exit the spinal column, combining in a bundle (plexus), passing through muscle and under bone to the upper arm, where the bundle divides to travel to the area it supplies with energy. Massage the bicep, tricep, deltoids, shoulder and neck muscles with the opposite hand. After ice massage, gentle kneading of these areas will help the tissue become less inflamed. Anti inflammatory medications may be necessary to assist your recovery. Do not confuse chemical applications as heat or ice therapy. Do not use heat or ice in conjunction with using chemical applications. Adhesive capsulitis aka Frozen shoulder can be very painful and greatly restrict normal functioning. Obtaining a correct diagnosis of this condition is the first step to recovery. Diligent treatment and care will ensure a complete recovery. Be well.